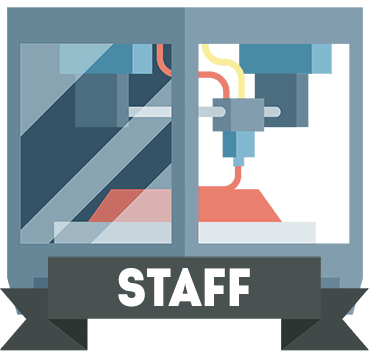 Even though the technology has been around for over 30 years, up until recently, 3D printing was reserved for a small group of professionals, completely unobtainable and unaffordable for the general public. Fortunately, this has changed now. Today, you can buy your own 3D printer for as little as $200 USD. Whether you’re an engineer, teacher, artist, or tech enthusiast, owning a 3D printer can open a new world of possibilities. But how do you know which model is the right one for you? At 3D Beginners we have made it our aim to become your go-to source for in-depth product reviews, buying guides, expert tips, as well as the latest news concerning 3D printing technology. We are a small team of tech buffs striving to find the best printers in every category and price range. Our reviews are 100% genuine and unbiased and we do not accept sponsored listings or payment for our reviews. Spending the majority of his youth less than a mile away from a large hardware shop, it was no wonder Justin decided to become a computer engineer. After graduating with a Bachelor’s degree from Carroll College, the Montana native began working in technical support. Justin’s hobbies include PCs, cooking, and riding his Honda across the 141. Robert is a student, writer, and hobby photographer born and raised in Helena. He has published articles on digital photography, PCs and printing technology in several online magazines and he shares his landscape and travel photography on his blog.